Your confusion is understandable, since the system panel header is usually oriented the long way horizontally, rather than vertically as it is on an ITX board. For this board, the power button connector from the PC chassis is connected to the two pins you have circled in red, above in your picture. That is, the GND (ground) pin for the PWRBTN pin is directly above it. NONE of the connectors from the PC case should be connected with their two pins horizontally on this header, they should all be connected vertically. The ground or negative (-) pins for each of the four connections is the negative/- pin directly above each type of connection. The PLED and HDLED + and - connections are oriented vertically in the picture. It would be inconsistent to then have the PWRBTN and RESET connections oriented horizontally on this connector. Which is why they aren't oriented horizontally. Regarding which wire from the PC case is + or -/ground, that depends upon the PC case manufacture. Some PC cases put a + and - on the plastic connector itself. Others color code the wires, as said above. It is true that the negative/ground wire will normally have a while line or white dashes on it. If that is not the situation with your PC case, that is beyond the control of a mother board manufacture. Do I need to open up a ticket with Asrock to get a "picture" diagramming where each cable should go or should I continue to try all variations with the potential of damaging my motherboard? This lack of clarity may be the reason why nothing would power up at all with my first motherboard. My second motherboard is exhibiting a power recycle loop. I have elected to get a new CPU and Memory sticks to rule out these components, but this all may be pilot error because I can't figure out where some stupid cables should be connected. Here is an official picture from Asrock Technical support on this issue. So you find my description inadequate? You cannot understand it at all? To the extent that you find it completely useless? Your explanation was clear but non-intuitive. 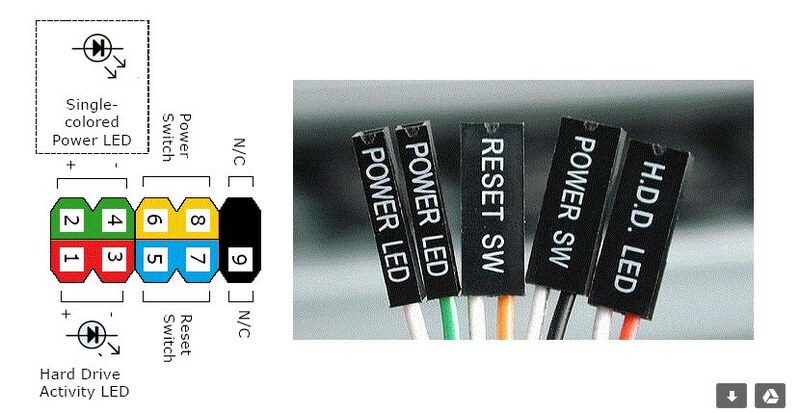 Why did Asrock change the orientation of the Reset and Power Button cables in respect to the PLED and HLED cables? I don't think I've ever done this in any other motherboard. I have built two Asus and One MSI motherboard and their manuals are clearer and the front panel pin orientation doesn't change up as you connect the other cables.